I received a couple of questions regarding the handling of the images directly after upload for the sample application done in part 1-4. The sample application finished in part 3 (part 4 is a backport to JDev 11gR1 only) has one minor glitch: it doesn’t display an uploaded image directly to the user after uploading it. The user has to commit the data after insert or update of an image before the image becomes visible. Users like to see the newly uploaded image before committing the row. This allows the users to cancel the change or select and upload another image. In this 5th part of the series we implement this. Before we start to implement let’s talk about how to implement this enhancement. 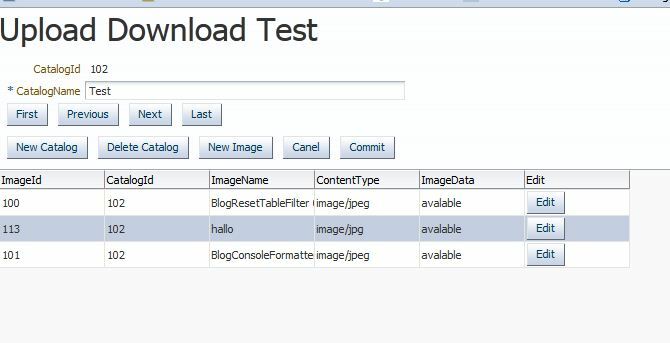 Why isn’t it possible to upload the image data into the blob and then just show the image from the blob via the servlet (see part 3)? The problem is that the BlobDomain uses a stream to read the data uploaded from the user. This stream can only be read after the BlobDomain is saved, meaning after the commit. The solution we implement in this part stores the uploaded data (inserted or updated) in a temporary file on the server. 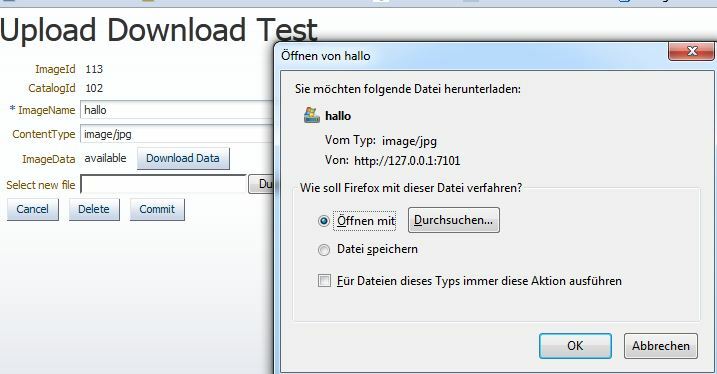 Then the server uses the image data from the temporary file to visualize the data. This sounds easy enough, however there is some house keeping to do to make it work. First we have have to find a place (folder) where we can store the uploaded data until it’s stored in the db or the operation is canceled. Then we need to distinguish which data to show from the servlet (file or blob). Finally we have to clean up the temporary file when we are done. Lets dive into the implementation. We start from the application at the end of part 3. As the current JDeveloper version is 12.1.3 we do the implementation in this version. The first task is to migrate the old application to 12.1.3. This is done automatically when opening the old work space in JDev 12.1.3 by answering the ‘OK’ to the migration popup. Nothing need to be done here. However, when you download the work space you’ll notice some clean up I did, like changing the old af:commandButton to the new af:button. One thing to notice is that the Apache Commons-IO version is updated to 2.4. This update made one other change necessary in the weblogic-application.xml file. 1) Save the uploaded data to a temporary file as well as to the blob. This is done for convenience. It’S possible to store the data first in the temporary file and only copy it to the BlobDomain when the user commits the changes. We implement a new java class UploadBlob which holds the BlogDomain and the path to the temporary file. This class also allows to test if a temporary is available. 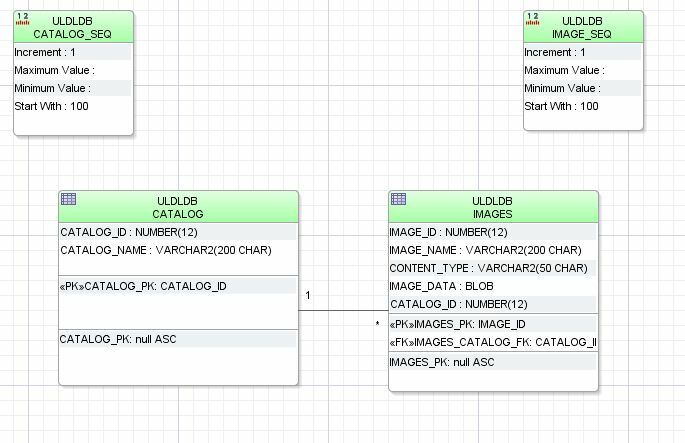 2) Use this class in the ImageBean.java class where the uploaded data is read. This happens in the valueChangeListener uploadFileValueChangeEvent(ValueChangeEvent valueChangeEvent). 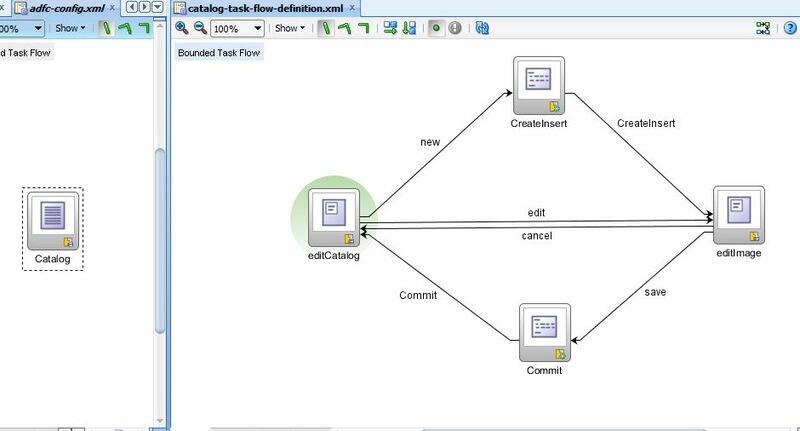 Depending on the new boolean parameter passed to the method a temporary file is created and the uploaded data is first saved to the temporary file. After that the data is copied from the temporary file into the BlobDomain. At this point the path to the temporary file is saved in the new class for later reference. In case of an exception the temporary file is removed. Finally in line 22 and 23 of the value change listener we check if a temporary file was generated and we set the path to it to a pageDef variable (see Creating Variables and Attribute Bindings to Store Values Temporarily in the PageDef). For this we use the code below. here the path to the temporary file is passed to the servlet as second parameter ‘tmp’. In lines 24-27 of the value change listener we send a ppr to the parent component of the af:image to show the now uploaded image. Another thing to do is to cleanup after the user either cancel or commit the changes. This is done in the cancel_action() or the commit_action() in the ImageBean. Here we call the deleteTemporaryFile() method which checks the existence of a temporary file and deletes it. // check if we find a temporary file name. In this case we allways use this! The gallery below shows the new work flow. The work space for part 5 can be downloaded from the ADF EMG Sample side BlogUploadDownload_12.1.3V4.zip. There is one missing part, which is that the whole sample was built using JDeveloper 11.1.2.1.0 using JSF2.0 components. Running the sample in newer JDeveloper 11.1.2.x versions in no problem (tested up to 11.1.2.4.0). However I got a couple of questions asking hoe to run it using JDeveloper 11.1.1.x version. The shown techniques are all version independent, so that you can used them in your own application, but have to build your own UI. I decided to backport the sample to run under 11.1.1.x too. Part 4 Sample build to run with JDeveloper 11.1.1.x. 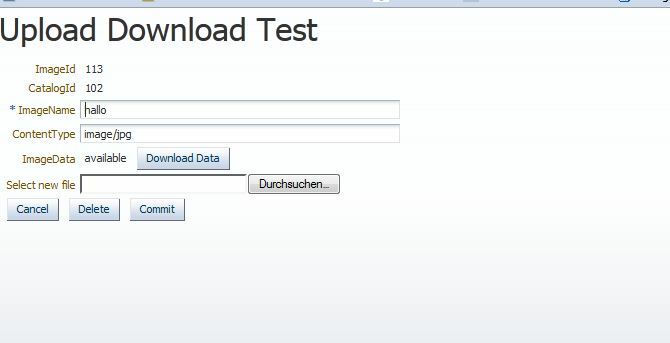 The sample can be downloaded from the ADF EMG Sample side BlogUploadDownload._R1V3.zip.